Camping tents are a secure way to enjoy your outings in the wild and 4 person camping tents are some of the best and currently most preferred. However, with various sizes and brands available, choosing the most appropriate tent for your upcountry backpacking or camping is one of the most difficult tasks for new and seasoned campers alike. Worry not. Camping is our hobby and we use our experience and professionalism to give you credible information that will help you make your choice for the best 4 man camping tent. Tents in this category range from between 49 square feet to about 101 square feet. When choosing a four man tent, shoppers should consider a few fundamental questions. Firstly, how big is the camping group? Secondly, what other camping equipment do you need to carry along? For instance, will you need to set up a cot or two in the tent? Or will you need a table and chairs from which you can sit and enjoy games when the temperature is too harsh to venture into outdoor games or activities. A bigger 4 person tent can conveniently accommodate up to 6 people which is good enough for small groups of campers and families. We take a look at the top 10 best 4 man tents. Hopefully, you will find one that not only interests you but also satisfies your needs. 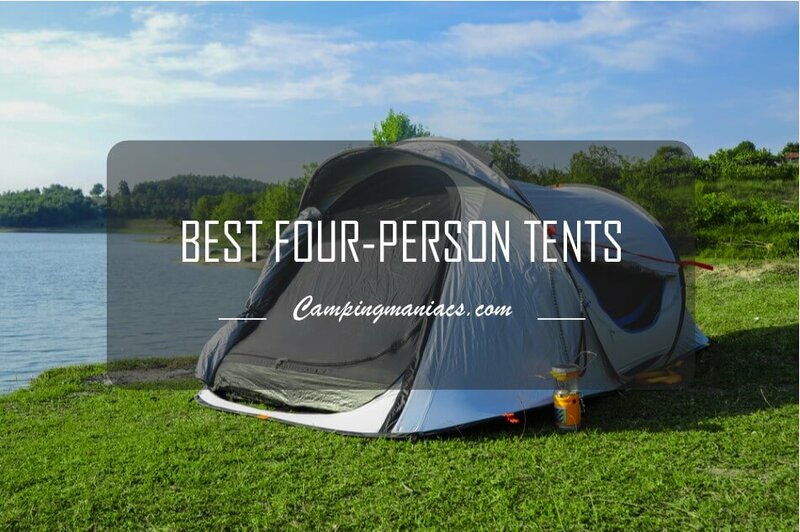 Which are the best 4 person tents of 2019? Without much ado, let's take a dive into it and see whick four-person tent best suits your needs. With an inside area of 60 square feet, the Big Agnes Flying Diamond 4 Deluxe Camping Tent is robust and features a sturdy frame that will not come down on you. This is an ideal gear for your base camp with family or friends on road trips, backyard or on vacation. Without lots of accessories, this tent will effectively accommodate up to 5 people hence ideal for small families or group of campers. That is not all about the 4 person camping tent as it will also accommodate at least a couple of standard size camping cots and at least a couple of chairs as well as a portable table. This provides ideal space for friends who would be glad to enjoy games or someone enthusiastic about reading when out camping. 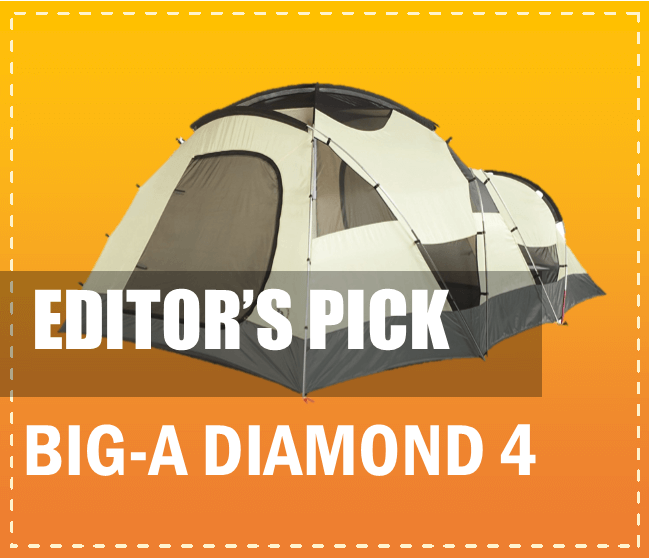 One of the most unique features of the Big Agnes Flying Diamond 4 Deluxe Camping Tent is its two doors. Both doors have two options for closure which include a zip up polyester fabric that guarantees full weather protection in harsh environments and a zip up mesh fabric that essentially provides commendable ventilation and air flow. Moreover, when you decide to divide the tent into two using a temporary curtain fabric, the two doors help to maintain privacy as each group have the convenience of using own door. Many campers are still skeptical of buying camping tents simply for the fear of not being able to set them up. Imagine you are out in the wild with your family, it is getting dark and you must set your base camp in time for you to prepare a meal and take a deserved rest in readiness for tomorrow's activities. While a tent that is not easy to set up will take you hours to set up and probably leave the whole group out in the cold, this cannot be said if the Big Agnes Flying Diamond 4 Deluxe Camping Tent. This is aided by hooks and loops that seamlessly connect to pole structure as well as sleeves and clips that efficiently attach the tent to the frame. These provide perfect pitch and unrivaled stability to the tent. Again, it comes with precut tensioners and guy lines attached to fly as well as webbings and buckles that make set up unimaginably easy. Has 15 mesh pockets that help in storing small camping accessories and items. Weatherproof material makes it your home away from home for all the four seasons. Not one of the best ventilated tents but not many people have raised this. The Big Agnes Flying Diamond 4 Deluxe Camping Tent is your ideal home away from home when camping in a group of 5 or less. Its versatility enables vestibules to be easily staked out as a shade using storm flaps or hiking poles on the vestibule zipper. The freestanding tent has a packed weight of under 15 pounds hence considerably lightweight and portable. This tent is one of the most popular tents in the market today and highly recommended. Can you set up a tent in just one minute? Well, with the Coleman 4 Person Instant Tent you can easily set up the tent in just one minute or less and take it down within a similar timespan. This tent therefore makes your camping easy and exciting as you do not have to spend much of the time and energy you would have used in other activities setting up or taking down the tent. With a maximum capacity of four people, this tent is ideal for a small group of campers. Despite having just a single door, the door is favorably positioned to allow easy entry and exit. Just like in the name, this is one of the few tents that you will absolutely set up in an INSTANT. It comes with preassembled poles which make this tent easy to assemble and also bring down. The tent measures 8 feet by 7 feet so in order to assemble, find an appropriate space of land that do not have rocks or trees. Lay your tent flat on the ground and open the door. Hold the pre-attached poles and use a hammer to secure them on the ground one after the other. Your tent will be set and secure in just one minute. No one would want to buy a camping tent that they will only use a couple of times and dispose of. The Coleman 4 Person Instant Tent is the kind of tent that will be your camping companion for years if not decades. Firstly, the preassembled poles are mode of high grade aluminum that will last for a long time while still providing the lightweight characteristic of outdoor equipment. What about the fabric? Well, this Coleman tent is made of a fabric that is at least twice as thick as your standard tent fabrics hence resistant to abrasion or rip. More interestingly, the tent is fully taped and this not only saves you from carrying along a rain fly but is also important in increasing the lifespan of your tent. Has two storage pockets for your accessories. Has reflective guy lines along the poles that will help you see what is around the tent when darkness sets in. The floor is quite noisy when you walk around it but this is a tent so not much walking is bound to take place. Coleman is a renowned for their expertise and experience in manufacturing high end outdoor gear and accessories. With the Coleman 4 Person Instant Tent, they have made a hit and rightly continue to put a mark as industry leaders. While this tent may not be bigger than most 4 man camping tents, it is still spacious, weatherproof and will provide amazing accommodation for campers in all environments. We recommend this tent for beginners and those who may not want the hassle of setting up complicated tents. Without compromising essential features of a camping tent, Coleman provides its esteemed customers with a budget friendly Coleman Sundome 4-Person Tent. The Sundome has an interior area of 63 square feet, boasts of a strong frame and fabric and commands a fanatical following among online buyers. The tent is most suited for use during summer as well as in areas with low to moderate winds and downpour. Given the space, this tent will comfortably accommodate two adults and an equal number of children or four adults with small or medium body sizes. What makes this tent stand out? Well that is exactly what this review discusses so read along. It is difficult to find a tent that is as ventilated as The Coleman Sundome 4-Person. The large door necessitates easy entry and exit and features a hooded fly which essentially provide ventilation even when there is rain. Secondly, Coleman incorporates a hooded window in the rear end of the tent to provide enough airflow for refreshing cross ventilation. Lastly, hooded mesh vents in the roof provides sufficient ventilation throughout all weather conditions. Do you need more ventilation and safety than provided by the Sundome? Whether you are camping in your backyard or thousands of miles away from home, weather out there can really be harsh. You need protection from extreme heat, cold, wind, rain and ground moisture among others. The Coleman Sundome 4-Person tent performs incredibly in all these conditions. The bathtub style 1000D polyethylene on the floor has welded seams and secure corners to protect you from leaky floor and extreme weather conditions. All ventilations including door, window and mesh on the roof are all hooded to prevent water from dripping into your tent when it is raining. It also important to commend the choice of coated polyester material and the workmanship used on the walls as this provides resistance and protection from leakage. Comes with a carry bag hence portable. Not spacious enough for four adults with big size bodies. Not ideal for use in environments with heavy rains and strong winds. Whereas the Coleman Sundome 4-Person tent has its letdowns just like any other product in the market, its strengths outdo the weaknesses. This budget friendly tent is rated alongside other tents that cost thrice or more its price. It is sufficiently ventilated, durable, and compact when packed, weatherproof and just like all Coleman tents, the Sundome is easy to set up and disassemble. As a matter of fact, you do not expect to get all these essential features at that price. Even when going to the back country in your car to camp, you should never be loaded with heavy camping gear and accessories. The North Face Talus 4 Tent is one of the most compact and lightest tents available. This gives you a chance and more space to carry other accessories such as when you decide to make a trip. The tent is therefore one of the top recommendations for people with a little space to carry a lot of camping luggage and gear. In fact, even without a private car, you can still move this tent to your camping site. If you need a tent that you can easily carry from one place to another then The North Face Talus 4 Tent is what you are looking for. With a trail weight of 6 lbs 10 oz and a total weight of 7 lbs 3 oz., the Talus tent is the most lightweight 4 man tent you will come across. However, this does not mean that the tent comes short on some key camping tent features. It has an internal area of 50 square feet and a peak of 127 inches hence falls within the recommended area for four person tents. As a family tent, there are high chances that you will carry along your kids or pets. You do not need to worry as the rugged floor is made of 70 denier nylon that has the ability to resist the carelessness of pets and kids. More importantly, you may never get a very even space out in the wild and this nylon material comes in handy as it effectively resists abrasion from rocks and roots. The fly and walls are made from 75 denier polyester that is both durable and also helps in keeping low maintenance costs. Compact and lightweight hence possible. Fly does not have an even pitch around the vestibules though this will not cause any problems. Too many venting panels may allow water in after years of use. Grab your family or two of your best friends and head into the wilderness with this lightweight, durable and versatile four person tent. The tent features enough ventilation that will certainly eliminate condensation, vestibules and double doors for easy access, a loft for all your water bottles and headlamps as well as taped seams to keep you dry. However, while this tent is designed and advertised as a four person camping tent, the interior space is most appropriate for a couple and two little children and not teens. If that is what you need a tent for then you will not regret choosing this tent over the others. Let us be honest! It is not easy to find outdoor gear that are conducive for all year camping and it gets more difficult when you want a tent for that purpose. You will agree with me that winter camping or mountaineering is always a hit or miss, particularly if your gear is not tried and tested. If you need a tent for harsh alpine conditions then the Mountain Hardwear Trango 4 Tent is exactly what you are looking for. Buying an ordinary summer tent will mean a lot of homework and scouting for the best weather before you venture out on a camping expedition. This is absolutely what this tent saves you from as it will keep you warm and dry throughout your camping spree. The tent is designed to withstand the extremely harsh conditions of the Snowdonian winter or the weather conditions of the freezing mountain peaks. It features taped perimeter seams, a taped fly as well as welded guy clip anchors and corners that have the ability to create a watertight protection without lowering ventilation. Again, it has clear windows that you will find helpful when checking the weather before you get out of your comfort zone. There are high chances that you will get depressed in a dull colored tent as you weight for the weather to get better before you venture outside. Well, the manufacturers of Mountain Hardwear Trango 4 Tent makes the tent bright colored to prevent your from this as you enjoy a few games in the tent with friends or family. Again, since winter is associated with moderate or low light, the poles come with color coded tents with reflective starter points for easy set up in low light. Storage pockets keep the tent more organized. Weatherproof hence suitable for all seasons. Comparatively heavier than most tents. Poles may rip after about 8 years and several nights of use. With a sleeping space of 57 square feet, the Mountain Hardwear Trango 4 Tent will comfortably house you and your friends. The freestanding tent is sturdy and will serve you for at least one decade even with frequent camps. Though designed for alpine camping or winter mountaineering, the weatherproof nature of this tent makes it ideal for all weather conditions. Therefore, irrespective of the kind of weather that you land into, you will never go wrong with this tent. Finding the best four person tent for a young family just got harder with the proliferation of 4 man camping tents in the industry. Well, Teton Sports, a renowned manufacturer of outdoor equipment, gives you a choice that is not easy to turn down. The TETON Sports Mountain Ultra 4 Tent is the ultimate camping tent for a small family who are out to enjoy their vacation together in a serene environment. The tent has all it takes to be your ultimate camping companion. Are you a couple with one or two kids? If your answer is yes then you really need to read further. With set up dimensions of 98 inches by 83 inches this tent ha sufficient sleeping space for all of you. Again, the inner micro mesh will ensure that you all stay in the tent with enough ventilation to avoid suffocation or condensation. The great features of this tent do not stop there! The fabric used in making the fly is weatherproof and will keep you warm and dry when it is raining. Finally, a small family does not need a big load when they go camping. This Teton product scores highly in this aspect as it has a packed weight of a meager 3.3 kg. This makes it one of the most portable camping tents you will come across. Well, we know you are out in the wild but is this enough permission to stay disorganized? To start with, the tent has a simple but classy design. It features two dome-shaped poles that are efficiently strengthened by a single cross pole that helps in keeping this unique shape and also makes the tent sturdier. Just like most modern tents, the TETON Sports Mountain Ultra Tent has two doors to allow easy entry and exit. Finally, there are two storage pockets and vestibules strategically located at the doors to help you store your accessories and make your camping tent look more neat and organized. Two vestibules help to keep camping gear more organized. The sides of the bathtub style floor are low and may be a disadvantage when there is a lot of water flowing across the tent. The TETON Sports Mountain Ultra Tent is your number one choice to consider when you need a camp for your family. It is spacious and has the capacity to accommodate two adults and four children or just four adults. Teton sports is a big name in the outdoor gear industry and has always been known for its high quality. This product is not left behind and will diligently serve you for years. Freestanding tents are gaining popularity day by day, so is the Kelty Grand Mesa 4 Tent. The Grand Mesa 4 tent is compact, weatherproof and easy to set up. With a floor area of 53 square feet, this tent is ideal for a group of four campers. The tent is solid and performs remarkably well in both hot and cold weather conditions. Just like most camping tents, this is most suitable for car camping especially with a group of boy scouts or girl guides. Find out why this tent beats its competitors. The Kelty Grand Mesa 4 Tent blends pole sleeve and pole clip mechanisms that make it easy to assemble. Being a freestanding camping tent, this product is easy to use as you can set up and easily move to an even ground without having to break down. Again, you do not need to carry small hand tools such as a hammer to help with fixing it on the ground. It also features a sleek design, noiseless zipper pulls and multiple guyout points that make using it a breeze. A number of camping tents currently on sale will provide remarkable ventilation and poor weatherproof mechanism or vice versa. The Kelty Grand Mesa 4 Tent combines the two in a way that is not easy to imagine. Rain fly vents and generous ventilation mesh on the walls are incorporated to necessitate good airflow and amazing moisture evaporation. On the other hand, the non-sagging full coverage polyester fabric is factory taped and features well joined seams to for efficient weather protection. Slightly heavier than the lightest tents. Without the rain fly, privacy is compromised. The Kelty Grand Mesa 4 Tent is a must buy for new campers or people who want to upgrade to a better camping tent than what they had before. The freestanding tent is easy to use, solid, sturdy and performs as expected for several years. At an affordable price, this is an amazing bargain for a group of 4 or less campers as it spacious, well vented and compact. To improve privacy, simply attach the provided rain fly on the doors and windows. Shopping for the most appropriate camping tent for more than two people is one of the greatest camping challenges that no one would ever want to go through. As usual, each camper will have his or her own camping gear and storing these will obviously be a nightmare. The nightmare increases when one or two of the campers are tall. The North Face Kaiju 4 Tent saves you from that nightmare as it provides ample sleeping space for campers and storage for their camping gear. One of the greatest considerations most people consider when choosing this tent is its size. With a sleeping area of 58.94 square feet, the tent offers adequate space for four adult size sleeping bags. While most camping tents do not have a long enough peak height, the North Face Kaiju 4 Tent has a peak height of 68 inches which will allow any tall person to stand up in it full length. Sleeping throughout while in the tent or standing while slightly bent can be tiresome and you no longer have to do that when camping. Many campers will mean more camping gear and equipment. The manufacturers of The North Face Kaiju 4 Tent puts this into consideration by providing ample storage options for camping gear. To start with, this tent is fitted with two vestibules with a storage space of 32.98 square feet cumulatively. Even with a lot of camping gear, this should provide enough storage. The inside of the tent has a number of storage pockets and hanger loops to help you organize ad keep your gear off the ground. Interestingly, one of the pockets conveniently pops up a tablet to keep campers entertained while in the tent. Amazing, right? High peak height for most people to stand up. Versatile as one vestibule is a convertible sunshade. Not one of the best designs. The North Face Kaiju 4 Tent is your four man tent that delivers more than it promises. It is sturdy and has enough space for all of you to have a comfortable rest when you need one. Featuring a tall peak height, most people will comfortable enjoy standing there when lying becomes tiresome. Despite the not so modern design when set up, this tent provides enough storage for all your equipment and gear hence making your camp homely and more coordinated. The multipurpose Slumberjack Trail Tent 4 is one of the most compact and durable tents you can come across today. It is best for festivals, canoeing, camping, base camp, night fishing or whatever next you think you will soon venture into. It features a 75 denier polyester fly which is appropriate for use over the 3 seasons. The fairly priced camping tent has floor dimensions of 98 inches by 83 inches hence ideal for four or less campers. This makes it suitable for small families or a group of friends. The 4 person 3 season Slumberjack Trail Tent is versatile and can be used just anywhere. While most tents are only ideal for summer or camping, this particular product has a wide range of uses courtesy of its easy set up and ventilation. It features pole to grommet connection, color coded clips and side release buckles that make setting up hassle free. The ventilation is also provided by the doors and enormous mesh wall panels. These features make this tent ideal for beach camps, festivals, base camp, back country camping, canoeing, fishing and many other outdoor expeditions where you are likely going to spend one or more nights in the wild. The quality of a camp tent entirely depends on the quality of the materials used in its construction. The Slumberjack Trail Tent uses high quality materials that ensures that it lasts for almost as long as you may need it. The 75D polyester floor fabric with 1200mm nonhazardous coating is both durable and protects you from harsh ground conditions. The multi diameter poles are made of fiberglass to reduce the total weight of the tent and to also provide sufficient room space for campers. Comes with stakes and storage bags. Roomy and will conveniently accommodate 4 campers. At 11 lbs 15 oz., this tent is slightly heavy. New users may need to read the user’s manual before assembly but this is so straight to the point. The Slumberjack Trail Tent is a new entrant into this competitive industry but has since attracted massive attention from camping enthusiasts and gear reviewers. At just over 15 pounds, this tent is considerably heavy though this has not been viewed as an automatic turn off particularly for campers using cars or trucks. It is a comfortable back country camping tent that is durable, easy to set up and highly versatile. For the many features highlighted above, this is a tent you will be proud to own. New campers have a tent that will meet their basic needs without having to break the bank. The Kelty Yellowstone 4 Tent is designed specifically for new users and parents working on a budget. Well, manufacturers have never been this mindful. Apart from the unrivaled cost, the Kelty product is cozy and easy to set up. Moreover, this price tag does not compromise any other essential qualities of a good camping tent as it compares competitively with tents that cost much higher than it does. Let us find out! The Kelty Yellowstone 4 Tent is a 4 person 3 seasons tent hence ideal for most camping sites. Using the shorckcorded fiberglass poles, simply stretch and secure the fabric using clips and sleeves. Setting up the tent will take you about 5 minutes and the tent features a single hooded door and two hooded windows necessary for sufficient ventilation even during downpour. Saying that the tent is weatherproof may be an overstatement. However, the waterproof feature of this tent will certainly keep you dry. You most probably do not want to draw attention by making creaky noises out in the wild. The technology employed in this tent ensures that the tent floor is slightly raised from the ground. Even when you walk on the floor you will not hear any sounds. In addition, the workmanship exhibited in the manufacture of this tent is highly secure and amazingly blends high quality, nonhazardous material choice and secure design. Spacious enough to accommodate 4 people. Weighs 9 pounds hence ideal for campers with a car or a truck. A few users claim that it has a shorter lifespan of between 7 and 10 years. This is however not widespread. New campers no longer have to look so much for an appropriate camping tent for them. The Kelty Yellowstone 4 Tent is specifically designed for new them. It is solid, affordable and easy to use. More importantly, the tent is more spacious and will provide ample space for about four people. How Safe Are the 4 Person Tents? A common question that parents always ask is if it is safe to use a four man camping tents together with their sons and daughters. Well, the answer is yes and no. As already mentioned, four person camping tents have a sleeping area of 49 square feet and above. As a matter of fact, small size four person tents will comfortably not accommodate four people. It is therefore professionally advisable to use four person tents with children below 12 years. That is to say, two parents and two children. For children above 12 years, it is advisable to separate tents by securing a smaller tent for them and using the four person tent for the two of you as well as storing most of the camping gear. However, in exceptionally larger four person tents like some reviewed here, four adults will comfortably fit in but all of them must be very decent sleepers. Finally, when you choose to use a tent with children it is important to consider a tent with sufficient ventilation and airflow.